Light and SUPer reactive, Coreban has created a series of boards with a spectacular and elegant wooden finish. Coreban's Pure Wood series are designed for those riders that value performance in a product. 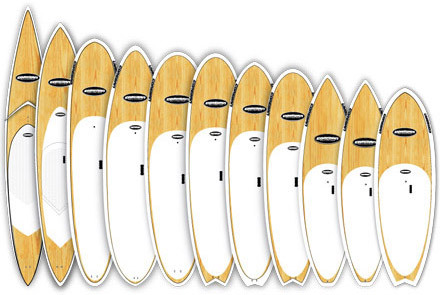 An australian pine superior deck, additional features, such as wooden fins, boardbag and a kick tail pad are some of the extras that make the Pure series the best in its class. Here's a video from Coreban showcasing their boards and the Pure line in action! Light multi-directional fiberglass layers between both sides of the board. The looks of the upper cover are achieved by using australian pine wood. The resistant surface finish is brought about by using a final epoxy resin layer.